Investors Are Betting Big Against Chipotle Mexican Grill. Are They Right? Wall Street's pessimism about the restaurant chain just hit a new high. The bears are lining up to take a bite out of Chipotle (NYSE:CMG). 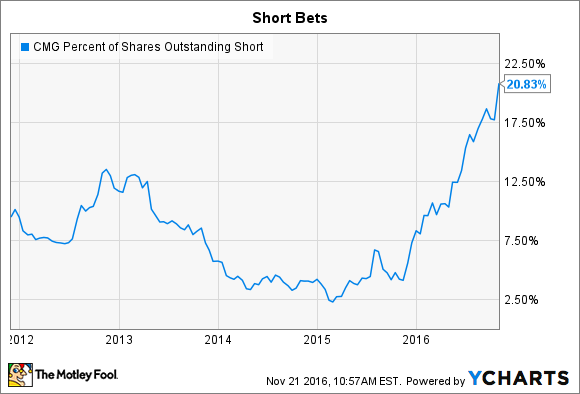 Short interest, which equates to bets that the stock is doomed to fall, recently shot up past 20% of the restaurant chain's outstanding share count. That puts Chipotle in some notably weak company. The former highflier joins just six other stocks in the S&P 500 with such a high proportion of bearish bets -- including struggling watchmaker Fossil and oil and gas drilling specialist Transocean. But are investors right to lump the burrito maker in with companies facing potentially crippling headwinds to their business? There's no question that Chipotle has lost much of its operating strength in the wake of last year's food safety scare. Revenue over the past nine months is down 18% as a growing store count only partially offset a 25% collapse in customer traffic. Profits are taking an even greater hit, since the chain is being pinched by decreased sales along with increased expenses thanks to spending aimed at minimizing the risk of another bacteria outbreak. Net income rose at an average rate of 28% for fiscal 2012 through 2014 before slowing to a 7% rise last year. So far in fiscal 2016, earnings have plummeted by 98% to barely stay above breakeven. CMG Net Income (TTM) data by YCharts. 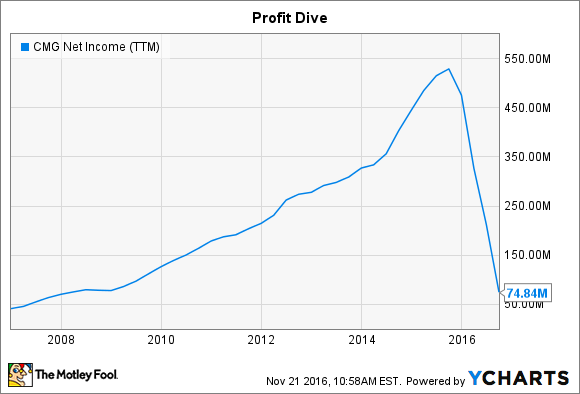 That stunning decline is the main reason why Chipotle's valuation has shot up to over 150 times trailing earnings from the 40 to 60 range that the company saw over most of the last three years. Is a rebound just a matter of time? In that context, Chipotle's 24% stock price decline over the last 12 months might seem tame. After all, its restaurant-level profit margins have been cut in half this year. The company is also far from seeing anything resembling sales growth. Comparable-store sales fell 22% last quarter, for hardly any improvement over the prior quarter's 24% decline. Management has tried to stress the silver lining in the chain's dark cloud of customer traffic losses. "We continued to make steady progress in our sales recovery during the third quarter," CEO Steve Ells said in late October. "We are earning back our customers' trust, and our research demonstrates that people are feeling better about our brand and the quality of our food." The bullish thesis assumes that with time, the food safety scare will be forgotten, and Chipotle will eventually recover from these losses and get back to its incredible sales and profit growth streaks that, until last year, were unbroken for its entire 10-year life as a public company. Bears are judging that the rebound won't happen anytime soon. And, with customer traffic trending lower by 20% at last count and profits holding at next to zero, it's hard to see what would protect Chipotle's stock from a further decline as it fights to win back its brand mojo. However, short-sellers are betting against one of the industry's best management teams in the pairing of co-CEOs Steve Ells and Monty Moran. And it's an executive suite that has demonstrated plenty of confidence that they'll recover from this food safety setback. At their direction, Chipotle has ramped up its buyback spending even though Wall Street has fled the stock. While it won't make much in the way of profits this year, the stock is valued at 25 times the $476 million of net income it produced as recently as 2015. As a long-term shareholder, I'm OK with that hefty premium because I'm with the bulls in thinking the business will eventually recover. Investors with shorter time horizons, or those who believe Chipotle's high-growth days are gone for good, might come to the opposite conclusion. And if you're in this camp, you'll have no trouble finding sympathetic views on Wall Street.